The Director-General of the Organization for the Prohibition of Chemical Weapons (OPCW) Ahmet Uzumcu said in a note in his forty-ninth monthly progress report on Monday that OPCW had verified the elimination of 25 out of 27 chemical weapons production facilities in Syria. UNITED NATIONS (Sputnik) — The report sums up the progress achieved in the elimination of the Syrian chemical weapons for the period from 23 September 2017 to 22 October 2017. "The Secretariat has verified the destruction of 25 of the 27 chemical weapons production facilities (CWPFs) declared by the Syrian Arab Republic. From 23 September to 6 October 2017, the Secretariat carried out annual inspections of five underground structures already verified as destroyed," the note said. 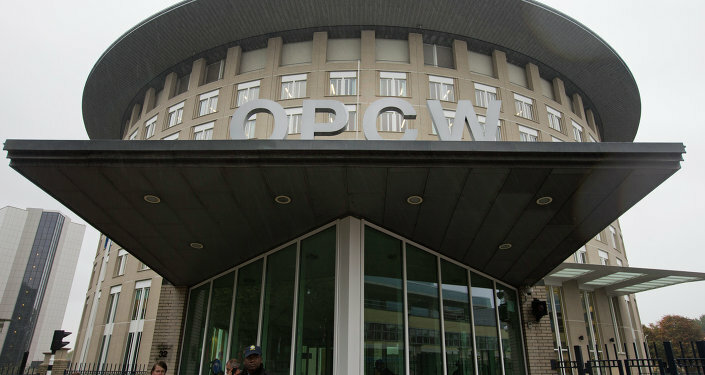 The note also said that during the period under review, OPCW proceeded with preparations to carry out an initial inspection of the last two stationary above-ground facilities to confirm their current condition. The Syrian government, he added, has previously requested assistance in the destruction of the facilities located in these two remaining sites. On October 26, the OPCW Joint Investigative Mechanism (JIM) issued a report that said the Syrian government was responsible for the April 4 sarin attack on Khan Sheikhoun. The Syrian government rejected the report and said the UN experts had not done any investigations directly at the scene of the incident. Russia Says UN-OPCW Syria's Khan Sheikhoun Report Looks Like "Amateur Document"